For some men, convenience is everything – especially when hustling out the door in the morning to face another day. Don’t have the time or patience to lather up and shave with a traditional razor? No problem. That’s why the shaving gods invented electric shavers. They’re convenient, fast, and still provide a close shave so that it doesn’t look like you trimmed your whiskers with a butter knife. In this post, we’re going to look at electric foil shavers, one of the two types of electric razors. We’ll take a look at our pick for the best foil shaver – the Panasonic ES8243A – discuss the differences between foil shavers and rotary shavers, and offer a quick tutorial on how to use an electric shaver. Let’s get started with some foil shaver buying tips. Speed isn’t always everything but it helps to have a speedy electric shaver. Here’s the catch, however: the “speed” of a razor doesn’t mean how quickly you can shave with it, but the speed of the blades. The faster the blades, the closer and more comfortable the shave. An electric shaver’s speed translates to Cycles Per Minute (CPM), and the top foil shavers generally have from 10,000 to 15,000 CPMs. Shavers with low CPMs can give you a lousy shave. No one likes to be in the middle of shaving when their razor runs out of power. An important buying consideration is battery life and it often varies from shaver to shaver. That said, a quality shaver should run for at least an hour before the battery runs out, while some high-end models easily last longer than that. Another thing to consider is whether your shaver comes with an additional power source, i.e., a cord that plugs into any outlet. Having both options – cordless and corded – makes for more convenient use, including when you travel. 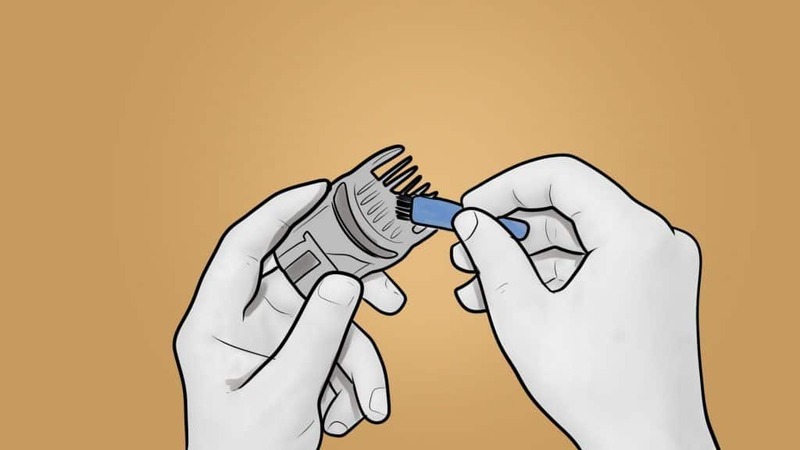 As a general rule, corded razors are more inconvenient than those that run on batteries because the cord may get in the way of your shaving and restrict your movement. If you prefer to shave while making coffee or fixing a bagel, a cordless model is for you. Just make sure that the cordless model you choose is rechargeable, however. 3. Can you use it wet or dry? Among other options to consider when buying a foil shaver is whether you want to use it for wet or dry shaving, or both. Wet shaving means you can use it in the shower (and with shave gel) to potentially get an even closer shave, while dry shaving is excellent for mornings when you’re running late and have only limited time to fit in your grooming routine. The price of foil shavers varies widely. You’ll find models as low as $20 and others that cost five times that, if not more. It all comes down to your budget and making sure you get the best razor possible in your preferred price range. Look for bargains in which a good razor comes at a discounted price, even if just for a limited time. The good news is that dependable shavers are available at almost any price. Keeping your razor in tip-top shape requires a basic maintenance plan, and cleaning is a huge part of that plan. How to clean a razor is another thing that varies from model to model but you should strive to clean yours after every use. As a general rule, foil razors are easier to clean than rotary shavers, while more expensive models may even come with a cleaning station. 6. Does it come with replacement foils? Electric shavers, just like traditional blade razors, need a blade replacement from time to time. It’s a good idea to check if a foil razor comes with a second set of foils. If not, make sure you know how to buy new foils and replacement parts and also the cost of those replacements. You’ll find a lot of reasons why you shouldn’t buy certain electric shavers. The Panasonic ES8243A isn’t among those razors – not by a long shot. Instead, it’s the best electric foil shaver available. The Arc4 shaving system is second to none and feature micro-thin, stainless-steel Arco foils that capture, lift, and hold whiskers so that the honed blades cut them cleanly at their base. It enables you to a cleaner, less-irritating shave, and also helps to reduce your shave time. Both the blades and foils are hypoallergenic. The ES8243A uses four blades instead of the three you’ll find on many other electric shavers, which helps to give you an even closer shave. The super-thin Arc4 foils easily conform to your facial contours – which not all foil shavers do – to help deliver the kind of close shave men prefer. The flexible pivoting shaving head enables you to maintain a uniform motion while shaving the chin, jawline, and neck – which can be somewhat tricky areas to shave. The Panasonic ES8243A has a high-performance linear motor that’s designed to shave at 13,000 CPM, which helps ensure peak shaving at all times (and through the whole of the battery’s life). You don’t have to worry about your shaver slowing down in the middle of the job, which can lead to a less-than-close shave and skin irritation. 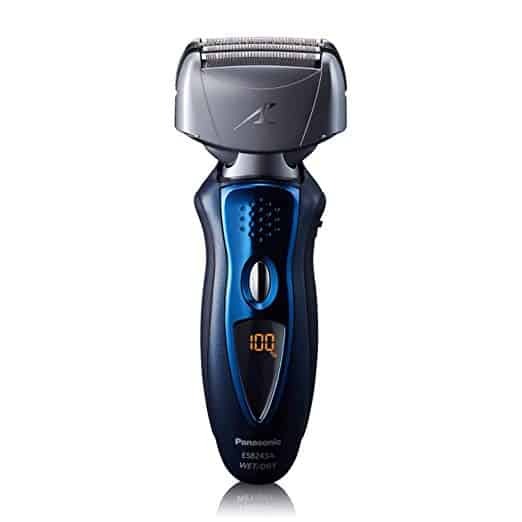 The ES8243A also comes with a pop-up trimmer that allows you to detail your mustache and sideburns. Another thing we like about this shaver is that it’s good for wet and dry shaving. If you’re rushing out the door and don’t have much time to spare, you can have a quick, dry shave, or you can shave in the shower or over the sink with a shave foam or gel when you have enough time. Users also like the ES8243A’s LCD that indicates when the battery is low, as well as displaying the battery’s charge status. 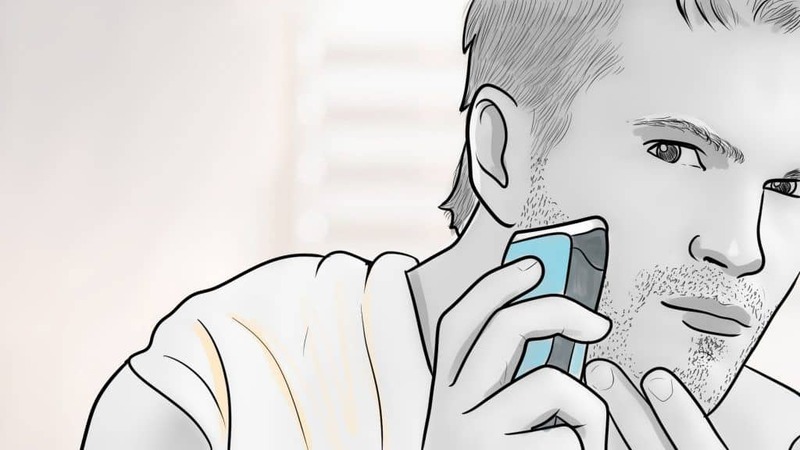 It even gives you a head’s up when it’s time to give your shaver a proper cleaning. You can’t go wrong with the Panasonic ES8243A Electric Razor. From its unique features, such as the Arc4 shaving system, to its versatility as a wet-dry shaver, it’s well worth your investment. When a company known for producing superior products call one of it shavers its best overall, you can’t help but take notice. That’s certainly the case with Braun’s Series 9 9290cc Electric Razor, which is a shaver worth your serious consideration if you don’t mind spending a little extra money. The Braun 9290cc is a high-end, supremely crafted shaver that its makers also call the “world’s most efficient” electric razor. That’s a lofty claim, indeed, but the folks at Braun aren’t exactly making a baseless boast. The 9290cc deserves a spot among the best shavers available today. We include it on our list of the best shavers for 2019 for a lot of reasons. For one, it’s tested – and works – on longer beards, while it includes Braun’s most advanced shaving technology. That technology includes five synchronized shaving elements that allow you to capture more hair in the first stroke than you can with most other shavers. The 9290cc’s five elements include four cutting elements and a skin guard that work together to give you a comfortable, close shave without skin irritation. You’ll love the clean-cut provided by the shaver’s titanium-coated blades, as well as its advanced flexible shaving head. The 9290cc comes with two specialized trimmers that capture even the most stubborn hair, while its AutoSensing motors, which is capable of 10,000 CPM, helps guarantee an efficient shave on even the thickest of beards. Another plus is that the Braun Series 9 9290cc is 100% waterproof and excellent for wet or dry shaving. You can shave in the shower and rinse the razor with water when it’s time to clean it up. But the 9290cc also comes with a 5-action Clean&Charge station that cleans the shaver hygienically while also lubricating and charging it. You’ll get a fresh start with your razor every day. The cordless 9290cc provides 50 minutes of uninterrupted shaving thanks to a Li-Ion battery that fully recharges in one hour. The shaver’s LCD provides a 5-step battery countdown, including the last nine minutes of shaving. The Braun 9290cc is a superior razor that you’ll pay extra for, but also one that’s worth every penny. It combines innovative technology with fine craftsmanship to provide users with a clean, comfortable shave every time they use it. Andis is a company you may or may not have of heard of but it does have a long history. Started in 1922 as the Andis Clipper Company, it manufactures shavers and sells their products in 90 countries. There’s something to be said for longevity – you must be doing something right – and the Andis 17150 Profoil Lithium shows that the company continues to crank out products relevant to today’s grooming world. Among the first things, one notices about the Andis 17150 Profoil Lithium Shaver is how lightweight and compact it is. 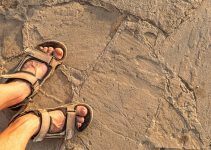 It’s easy to maneuver it around your face, including in the face’s tricker contours, such as the neck and jawline, and also compact enough that it’s ideal for travel. And, if you have trouble with your hands, such as arthritis, the 17150 is light enough that you can still give it a firm grip. The 17150 comes with staggered, hypo-allergenic foil heads that provide a clean, comfortable shave without razor burn – a huge plus for men with sensitive skin. While the Andis 17150 comes with a charger, it also has Lithium-Ion battery that lasts up to 80 minutes when fully charged. Not many shavers have a battery life as long as this one. Another reason we took a closer look at the Andis 17150 was because many professional barbers prefer it over other brands. It works on all hair lengths, including whiskers that have grown for several days, and it’s excellent for men with particularly curly facial hair, such as black men. All in all, it’s the best foil shaver for barbers, but it’s certainly good for home use, as well. The Andis 17150 provides a stress-free shave and works for men of all whisker lengths. It’s also easy to handle and has a battery life that’s second-to-none. It’s definitely worthy of your attention. Not every quality electric shaver has to be a burden on your budget. The Braun Series 3 ProSKin 3040 Electric Razor is a prime example because you’ll get a top-notch razor that works better than many more expensive models. We think it’s the best foil shaver under $100. Braun is an iconic name in the shaving industry with a long history of producing excellent, innovative shavers that feature fine German craftsmanship. Their designs are simple and intuitive to use, and the Braun 3040 is no exception. It works efficiently – which means you don’t have to shave over the same spot twice – and minimizes skin irritation. But there are other reasons for including the Series 3 ProSkin 3040s on our list, including Braun’s patented metal mesh SenoFoil that enables you to get a close shave without discomfort. The 3040s comes with three specialized shaving elements that work together, including extra-sharp blades that cut hair cleanly every time. It also features Braun’s MicroComb technology that enables you to capture more hair than you do with many other shavers, and also allows you to save time when shaving. While the blades are sharp, they’re also pressure sensitive. That means they’ll automatically retract from your skin to protect you from abrasions while providing a gentle shave. What else do we like about the Braun 3040? For starters, it comes with a built-in precision trimmer located on the back of the shaver that’s ideal for trimming work and shaping sideburns. It’s also 100% waterproof and it’s good for wet and dry use. Braun knows a thing or two about electric shavers and their Braun ProSkin 3040s is another in their long line of excellent products. While there’s nothing overly fancy about it, you can rest easy in knowing that it will provide a close, comfortable shave with every use. Shaving with a foil shaver is different from shaving with a rotary shaver because of the difference in their shaving heads. Foil shavers move – and cut – best in a straight line, while rotary shavers work best when used in circular motions. But let’s talk about best practices and how to use a foil shaver. Just like it’s wise to stretch your muscles before working out, there are things you can do to prepare your face before shaving with a foil razor. 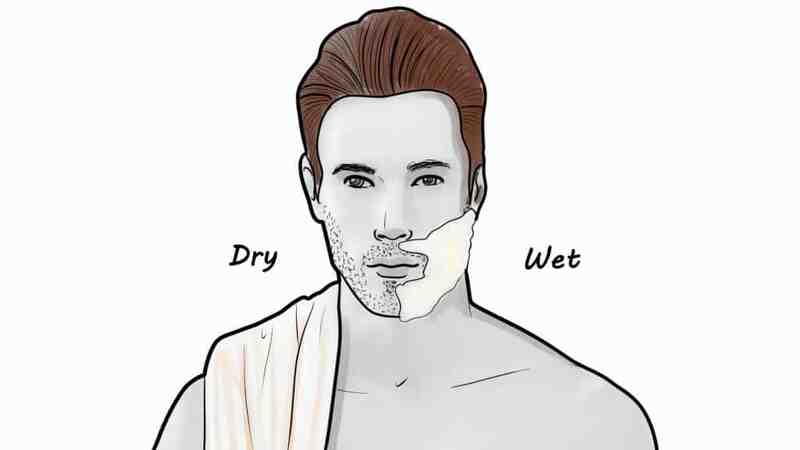 Get rid of any moisture on your face or shaver before you dry shave. Don’t wash or exfoliate your face before shaving and make sure your shaver is completely dry, especially if you’ve cleaned it with water. Use an electric pre-shave lotion or powder that provides a layer of lubrication when you’re dry shaving. It will tone the skin and make your whiskers stand up straight. Make sure your shaver has a full charge. It’s not a requirement, mind you, but some shavers don’t maintain their peak power (and speed) when the battery has drained a bit. 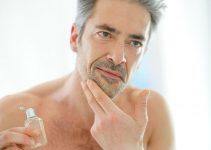 A sluggish shaver increases the chances of it pulling and tugging on your whiskers as you shave. Clean your shaver before you use it. Dirt and leftover hair affect the shaver’s performance, while a grubby razor is an excellent place for bacteria to thrive. Make sure the blades are sharp. It’s not something you have to stress about every time you step in front of your bathroom mirror but you’ll probably need to change your foils and blades once a year depending on how often you shave and the coarseness of your beard. Last, but not least, make sure your whiskers aren’t too long (like 3 or 4 days worth of growth) because a foil shaver doesn’t cut longer hair as efficiently as it does short, fine hair. By “wet” shaving we mean using a shave cream or gel, although you can use many foil shavers in the shower, as well. If you decide to use shaving cream, apply it to your face as you normally would when using manual razors. 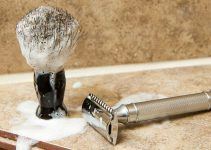 Bravo if you have a quality shaving brush, such as those reviewed in this article, because it’s the best way to apply shave cream. In any case, let the shave cream on your face for five minutes to soften your whiskers. Most shaving experts advise men to shave the sensitive areas of their face first when using a foil shaver before the shaver begins to heat up a bit. Shave with short strokes and in straight lines; don’t use circular motions as you would with a rotary shaver. There’s also no need to press the shaver too hard against the skin; let the blades do the heavy lifting while reducing the risk of irritating the skin. That said, use your fingers to pull tight the skin over which you’ll shave. You’ll eliminate creases and make it easier for your shaver to glide evenly over your skin. A good place to start is your neck area, which is more sensitive. You can then move on to your face while starting at your jawline. Not only is it important to stretch your muscles before your workout but it’s important to stretch them afterward, as well. The same goes for shaving – make sure you follow a post-shave routine that with soothe your face and prevent it from becoming irritated. Using a quality aftershave is always a good idea. So is cleaning your shaver after each use, and one of the advantages of foil shavers is that they’re easy to clean and maintain. Most come with a small cleaning brush, while others come with a small cleaning station that also lubricates and dries your blades. It takes a week or two for your skin to adjust to using an electric shaver if you’ve just switched from a manual razor. The same holds true for switching from a rotary to a foil shaver. Moreover, it may take some time to adjust to the techniques of electric shaving. Your choices of electric shavers come down to two types – foil and rotary. 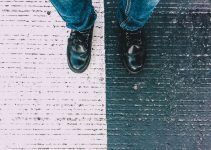 We’re spending the bulk of this article talking about foil shavers, but it’s important to know the differences between the two types as well as the advantages and disadvantages. The main difference between foil and rotary shavers is the type of metal grating used to grab your whiskers so the blades can cut them. A foil razor has several rounded blades aligned under a thin, foil comb. Your whiskers get cut when they pass through the grating and get sheared by oscillating blades. 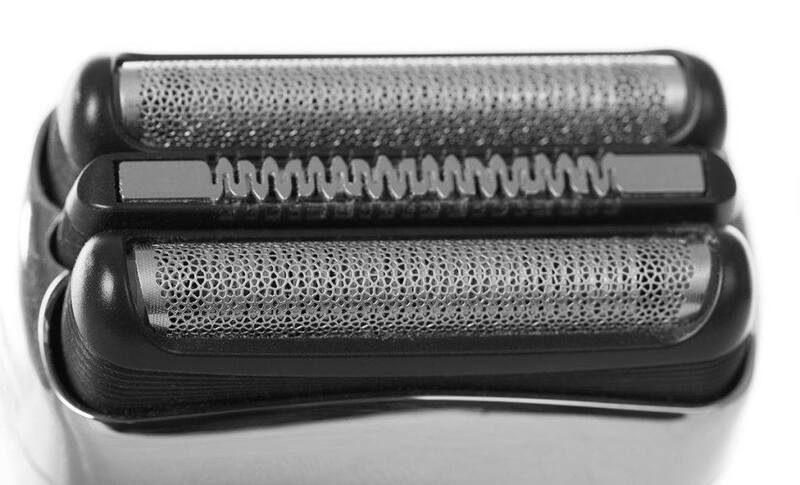 A rotary shaver has three (and sometimes four) flexible shaving heads with blades underneath that cut hair as they pass through the slots in the surface of each head. Rotary shavers have been around for almost 80 years, so there’s nothing new about them. Rest assured, however, they’ve come a long way since then and the technology used to create them is ever-changing. So, you might ask, why should I choose a foil shaver over a rotary shaver? Both do an effective job of cutting your whiskers, but let’s take a closer look at why you might pick a foil shaver. Foil shavers typically more speed than rotary razors. We’ve already discussed what speed in a shaver means – and the importance of cycles per minute – and a foil shaver tends to provide speedier grooming. Many men swear by foil shavers because they believe that foil shavers provide a closer shave than rotary shavers. One of the main reasons foil shavers provide a close shave is because of its microfoil, which is thinner than the shaving heads on rotary shavers. Again, many men feel that foil shavers are best for shaving sensitive skin but that’s not to say it’s a given that rotary shavers, by comparison, don’t do as good of a job on sensitive skin. Foil shavers have a rectangular shape which makes it easy to maneuver them around while you’re tidying your sideburns and mustache. Or, if you have, say a soul patch or goatee, a foil shaver works best to shave around them. There’s hardly anything complicated regarding the maintenance of a foil shaver. If it’s suitable for wet and dry use, cleaning it is as easy as running it under water to remove leftover bits of hair and shaving cream or gel. Cheaper models may require you to remove the foils before rinsing the shaver with water. Foil shavers are like everything else in this life, i.e., they’re not perfect. They’re damn good, mind you, especially the top-quality shavers that we reviewed above, but you need to consider their drawbacks, too. Most users agree that foil shavers are noisier than rotary shavers. 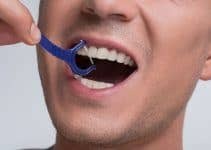 It’s not that foil shavers will wake the neighbors, but they may be loud enough – in some cases – to disturb those in your house who don’t sleep as soundly as others. If you prefer to move your shaver in circular motions when shaving, then a foil shaver may not be for you. Foil razors shave in straight lines, either vertical or horizontal, and doesn’t fit the natural contours of your face like a rotary shaver. Rotary shavers do an excellent job on longer facial hair. If you’re one of those guys who shave every third or fourth day – when whiskers become a bit more than stubble – then a rotary shaver is a safe pick. Rotary shavers also work well on coarse hair. 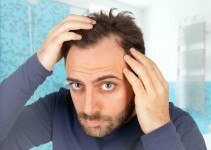 That’s a good thing for many reasons, including that coarse facial hair tends to grow in different directions, becomes tangled, and can cause skin irritation. The rotating heads on the rotary shavers make them ideal for shaving the many contours of your face that are often hard to reach with other razors – such as under the nose, around a sharp jawline, and around a prominent Adam’s apple. Rotary shavers are quiet in comparison to foil shavers. While rotary shavers allow you to better shave around the contours of your face, they don’t offer a down-to-the-skin close shave as do quality foil shavers. While that may not be true in the case of every rotary shaver available, it seems to be the consensus of many men. Cleaning a rotary shaver means removing a bunch of parts and then re-assembling it again after you’ve cleaned out the excess facial hairs and shave gel. As a result, users may have the temptation to put off cleaning their rotary shaver and shorten its lifespan. Research shows that a few select companies dominate the electric shaver market. That makes it both easy and tough to pick a list of 2019’s top foil shavers; easy because the majority of their products get rave reviews, but tough because it’s harder to create a multi-company list. 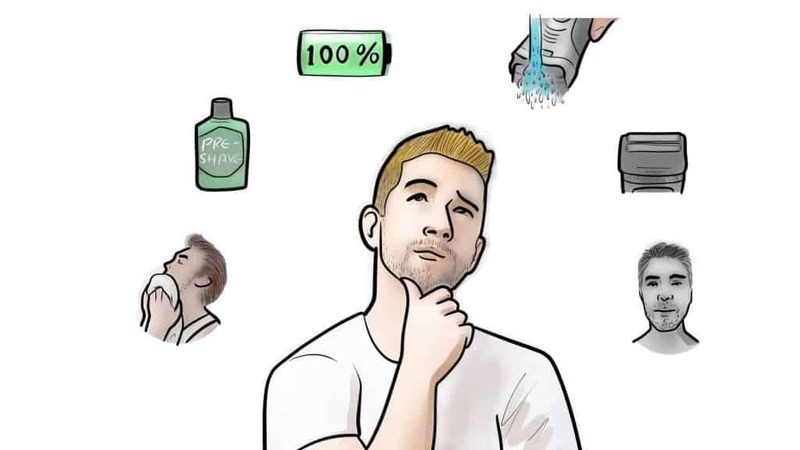 In the end, however, it wasn’t about brand name but about how well a shaver worked and the kind of reviews it received from consumers and shaving experts. The ability to provide a smooth, comfortable shave was a key consideration, as was durability and the quality of features that came with each shaver. We also considered the price and strived to include both higher-priced and budget shavers on our list. How about you? What electric shaver do you use, and why? Have you shaved with any on our list? We’d love to hear from you and welcome your comments and suggestions.